Prior to the Islamic Revolution in 1978, Donia Bijan and her family lived a charmed life in Iran. You can hear the pride in her words as she writes of her doctor father and nurse mother who built a hospital from the ground up. Raised in an apartment above the hospital, Donia and her sisters were raised not only by their parents, but by the nurses at the hospital as well. Even as she plays the role of nurse and mother, Maman (I don't recall the author ever giving her actual name) also takes on women's issues and politics. Not only does she serve on the board of several organizations fighting for women's rights, she becomes the director of Tehran's first nursing school and serves in parliament. While all of these actions are notable, they also prove to be a factor in her family's exile from Iran. 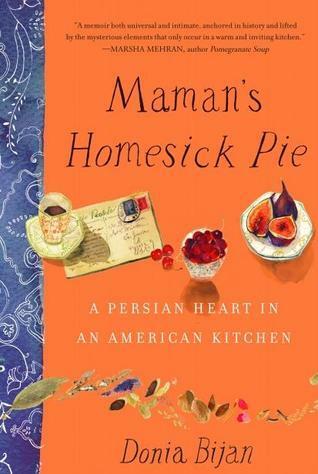 Spanning her family's time first in Iran, then in Spain and finally in America (with an interlude in France), Maman's Homesick Pie is as much a love letter to the author's mother as it is a cookbook. While her father wanted Donia to be a doctor, and was quite disappointed that she was not, her mother encouraged her love of cooking from a young age and went to great lengths to make sure her daughter could achieve her dream. The end of each chapter includes a recipe or two that ties back to something the author has mentioned in that chapter. She includes an anecdote about her mother or why she or her mother created the recipe. Though some of the recipes didn't necessarily appeal to me, I did find myself dog-earing a few pages for recipes I definitely plan to go back and try.